In addition to offering some of the top rated new vehicles, the Insurance Institute for Highway Safety (IIHS) has named Honda Vehicles as one of the safer options for new, teen drivers. IIHS has discovered that vehicle crashes are the number one cause of death among teens, and has suggested that the type of automobile they are driving has a huge effect on the level of risk they are exposed to. Additionally, the research conducted by IIHS has shown that a number of teens are driving used vehicles that do not have important safety technology, which is why they create a list to help parents make safer choices for their teen drivers. Pre-owned vehicles from Honda have earned recognition from the IIHS, as the safest and best choices for teenage drivers – all for an affordable price. The vehicles that received this rating included the Honda Odyssey (2011 models and after), Element (2007 models and after), CR-V (2012 models and after), Accord Coupe (the 2013 and 2014 models) and the Accord Sedan (2012 and after). The Honda brand is dedicated to the safety of their customers, as well as the quality of the products that they offer for sale. The long-term commitment of the brand has helped to enhance durability and safety of the Honda vehicles, making them an ideal choice for finding safe and reliable transportation, no matter if the vehicle is pre-owned or new, for every driver, which includes teens. For additional peace of mind, any customer who selects a Certified Pre-Owned Honda vehicle will be given an extensive warranty. According to recent statistics, the Honda brand is considered one of the longest lasting and most durable brands available in its class. Each of the Honda vehicles that are included in the list are also equipped with the Vehicle Stability Assist, that features traction control and they also offer sufficient protection in the crash tests. 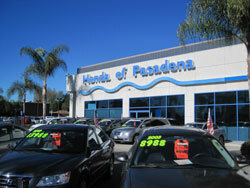 If you are worried about your teen driver, then visiting Honda of Pasadena is a must. They offer a huge selection of the top rated used vehicles, which will help give you peace of mind that your teen is safe while on the roads. Visit today and experience what great customer service truly is. This entry was posted in Honda Certified Pre-Owned, Used Cars in Pasadena and tagged Highway Institute, Honda, Pre-Owned Cars, teenage drivers by Honda Pasadena. Bookmark the permalink.